This visualizes the processing of reality in order to realize and actualize Natural Law as a part of our Essence and Substance of being, living and doing. Aligning, embodying and exemplifying Natural Law is to make Truth and Morality our Path and Way in Life. This is my own representation of an Alchemical Distillation Lab with respect to the individual process of developing Natural Law in ourselves. This is not the full “7 step” process that others describe. 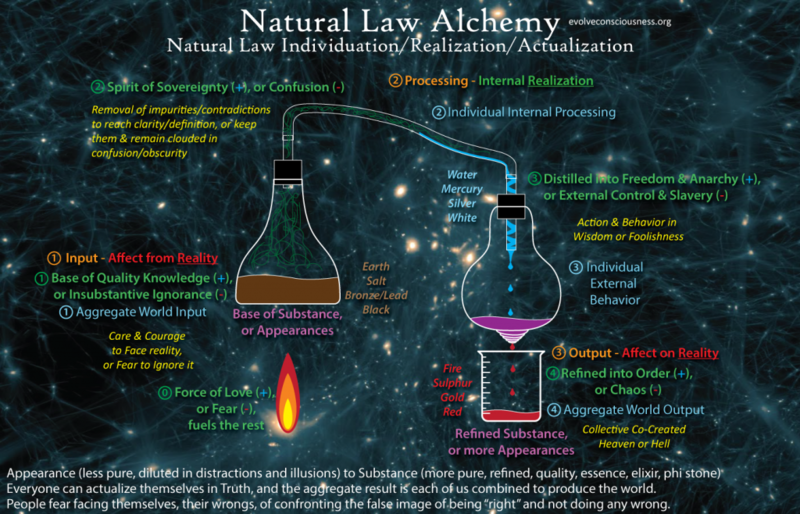 This is my own representation of an Alchemical Lab with the processes of Natural Law individuation corresponded with (as usual) the Trivium (Input-Processing-Output). If you are not familiar with the information presented herein, please study my earlier work.